This is the latest in Delphian's fascinating series exploring instruments of the past as part of the European Music Archaeology Project. On this disc Anna Friederike Potengowski plays pre-historic bone flutes, and she is joined by percussionist Georg Wieland Wagner. 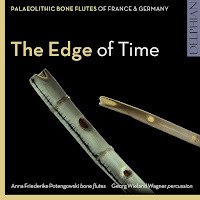 Potengowski is playing four reconstructions of bone flutes which are based on flutes found in archaeological excavations. These represent some of the earliest known evidence of musical creation. Inevitably, the music on the disc is speculative. Not just the music, few of the bone flutes survive complete so there is an element of speculation in the reconstructions too. Both Pontengowski and Wagner have written pieces which explore what is possible with the flutes and percussion, and to these are added a piece by Rupert Till and John Cage's Ryoanji. Pontengowski is wonderfully adept at getting a range of colours and styles from the instruments. The results are intriguing and atmospheric, though I have to confess that quite often the music reminds me of background music to films. It seems to evoke the sort of sound-tracks that come with film journeys up the Amazon..